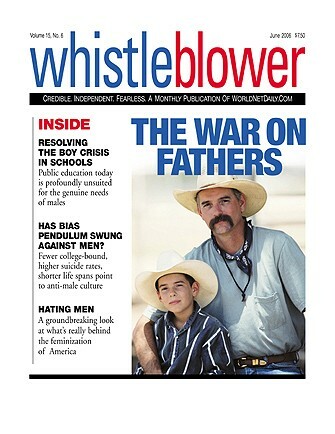 The June 2006 edition of WND's popular Whistleblower magazine is a mega-eye-opener exploring one of the most crucial but little-reported phenomena of modern America – what WND calls "THE WAR ON FATHERS." SCHOOL: In public school classrooms across America, in every category and every demographic group, boys are falling behind. Girls excel and move on to college, where three out of five students are female, while young boys – who don't naturally thrive when forced to sit still at a desk for six hours a day – are diagnosed by the millions with new diseases that didn't exist a generation ago. To make their behavior more acceptable, they are compelled to take hazardous psycho-stimulant drugs like Ritalin. Boys are more than 50 percent more likely to repeat elementary school grades than girls, a third more likely to drop out of high school and twice as likely to have a "learning disability." And the suicide rate among teen boys is far higher than that of girls. "What we have done," explains Thomas Mortenson, senior scholar at the Pell Institute for the Study of Opportunity in Higher Education, "is we have a K-12 school system that seems to work relatively well for girls and does not work for a very large share of boys." HOME: It's well known that roughly half of America's marriages end in divorce, but not nearly as well known that two out of three of those divorces are initiated by the wives. Moreover, America's family court system is scandalously biased in favor of the mother in child custody disputes. Fathers get custody of children in uncontested cases only 10 percent of the time and 15 percent of the time in contested cases. Meanwhile, mothers get sole custody 66 percent of the time in uncontested cases and 75 percent of the time in contested cases. "Where you have minor children, there's really no such thing as no-fault divorce for fathers," says Detroit attorney Philip Holman, vice president of the National Congress for Fathers and Children. "On the practical level, fathers realize that divorce means they lose their kids." Unfortunately, this loss by children of their fathers' influence is directly responsible – far more than any other cause – for the modern national scourges of gang life, crime and much more. CULTURE: Fifty years ago, "Father knows best" was a hit TV show, in which insurance agent Jim Anderson (actor Robert Young) would come home from work each evening, trade his sport jacket for a nice, comfortable sweater, and then deal with the everyday growing-up problems of his family. He could always be counted on to resolve that week's crisis with a combination of kindness, fatherly strength and common sense. Today, television virtually always portrays husbands as bumbling losers or contemptible, self-absorbed egomaniacs. Whether in dramas, comedies or commercials, the patriarchy is dead, at least on TV where men are fools – unless of course they're gay. On "Queer Eye for the Straight Guy," the "fab five" are supremely knowledgeable on all things hip, their life's highest purpose being to help those less fortunate than themselves – that is, straight men – to become cool. "The carnage committed by two boys in Littleton, Colorado," declares the Congressional Quarterly Researcher, "has forced the nation to reexamine the nature of boyhood in America." William Pollack, director of the Center for Men at McLean Hospital and author of the best-selling "Real Boys: Rescuing Our Sons from the Myths of Boyhood," tells audiences around the country, "The boys in Littleton are the tip of the iceberg. And the iceberg is all boys." There are now conferences, workshops, and institutes dedicated to transforming boys. Carol Gilligan, professor of gender studies at Harvard Graduate School of Education, writes of the problem of "boys' masculinity … in a patriarchal social order." Barney Brawer, director of the Boys' Project at Tufts University, told Education Week: "We've deconstructed the old version of manhood, but we've not [yet] constructed a new version." In the spring of 2000, the Boys' Project at Tufts offered five workshops on "reinventing Boyhood." The planners promised emotionally exciting sessions: "We'll laugh and cry, argue and agree, reclaim and sustain the best parts of the culture of boys and men, while figuring out how to change the terrible parts." "Terrible"? As this edition of Whistleblower shows, there is nothing wrong – and a very great deal right – with boys and masculinity. As maverick feminist Camille Paglia courageously reminds her men-hating colleagues, masculinity is "the most creative cultural force in history." "The problem," said David Kupelian, managing editor of WND and Whistleblower, "is that misguided feminists, intent on advancing a radically different worldview than the one on which this nation was founded, have succeeded in fomenting a revolution. And that revolution amounts to a powerful and pervasive campaign against masculinity, maleness, boys, men and patriarchy." "Banning 'mom' and 'dad,'" by Joseph Farah, who exposes the latest in bizarre and dangerous legislation by the California legislature. "The fathers' war" by Stephen Baskerville, a troubling look at how increasing numbers of America's military men risk all to serve their nation in wartime, only to be divorced by their wives and lose their children. "The war on fathers," by David Kupelian, an in-depth look at what's really behind the feminization of America. "Why men are being attacked," by Dr. Laura Schlessinger, who says: "It isn't all about hating men – it's largely about disdaining and dismissing them." "Has the bias pendulum swung against men?" Fewer college-bound, higher suicide rates, shorter life spans suggest males getting shaft. "Paternity fraud rampant in U.S.," showing how 30 percent of men assessed for court-ordered child support are not actually the fathers of the children receiving the support. "'Shared parenting' seen as custody solution," a look at bills in New York that would require courts to treat mom and dad equally. "Resolving the boy crisis in schools" by Jeffery M. Leving and Glenn Sacks, showing how today's public schools are profoundly unsuited for the genuine needs of boys. "Child support gold-diggers" by Carey Roberts, who shows how frequent fraud results in fathers being victimized by the justice system. "Hating our fathers, hating ourselves" by Bob Just, a penetrating look at the high cost of resenting the fathers and husbands in our lives. "This is one of the most soulful, important and insightful issues of Whistleblower we've produced in a long time," said Kupelian. "I urge people to read it – it's much more than eye-opening. It could be life-changing. Really."